November 01, 2016, 2:57 p.m. Recently, CoverGirl named 17-year-old makeup artist and Instagram celebrity James Charles as its first male spokesmodel. The announcement comes at a time when more and more companies are attempting to expand their customer base by erasing traditional gender lines that separate men from women. 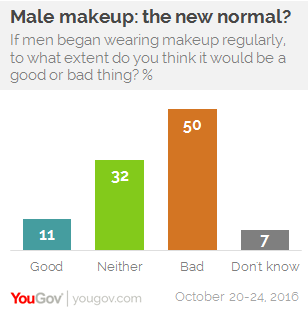 New data from YouGov shows that despite CoverGirl&apos;s decision to hire its first CoverBoy, 50% of the general public believe it would be bad if men started wearing makeup on a daily basis. At the same time, about a third of US adults are indifferent to the idea, while only 11% think men wearing makeup would be good for society. That said, additional data reveals that young people are far more open to the idea of men donning nail polish and mascara than older generations. When it comes to nail polish, for example, 41% of people aged 18-34 report that it&apos;s acceptable for men to wear it, compared to 28% of people aged 35-54 and 17% of those 55 and over. Meanwhile, attitudes toward men wearing cologne — a beauty product long used by men — hover above an 80% acceptability rate for all three age categories. An analysis of America&apos;s views on men using moisturizer and wearing mascara shows similar results. 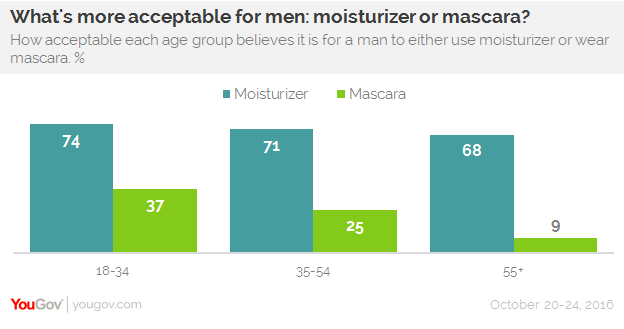 While the majority are okay with males applying moisturizer, most are not alright with men coating their eyelashes. 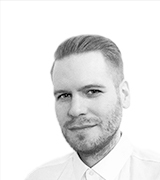 37% of Millennials aged 18-34 say it&apos;s acceptable for men to wear mascara, compared to just 25% of those aged 35-54 and 9% of those 55 and older. Apart from a sharp divide across the different age groups, another division exists between the sexes. When asked if it&apos;s acceptable for men to wear various makeup products — from nail polish to eyeshadow, mascara to lipstick, blush to foundation — women were consistently more likely to say it was than men.